Big Brothers Big Sisters Pikes Peak works to support the students enrolled at Atlas Preparatory High School through their Mentor2.0 program. 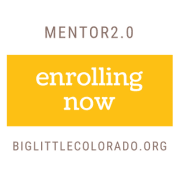 Mentor2.0 is a technology-enhanced, school-based, one-to-one mentoring program that ensures students in low-income communities have the support needed to graduate high school and prepare for a post-secondary education. The average student-to-counselor ratio in the United States is 471 to 1. With Mentor2.0, every student in the program has a mentor who works with him or her each week - leading to increased high school graduation and college enrollment rates, and ensuring that the students have every opportunity to reach their full potential. Mentor2.0 is bridging the gap for high school students who are eager to learn about post- secondary opportunities. Mentors share real life experiences that help students explore educational, skilled trade, and military career opportunities over the course of their high school career. Big Brothers Big Sisters is closing the gap between industry shortages and qualified applicants by beginning the conversation early and having it often. Mentors are still needed to match with the freshman class. Please consider volunteering to make a difference in the life of student in Colorado Springs! Essentially, one e-mail per week and one event per month (at Atlas). Pass screening process, including several background checks.